Combine in a large bowl, the first 6 ingredients. Add the salt and pepper. Toss three to four times. Throng the salad into a cold salad bowl. Top salad with cheese. 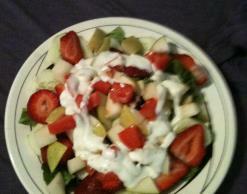 Pour the Kraft Ranch Dressing into the salad.